Psyllium /ˈsɪliəm/, or ispaghula /ˌɪspəˈɡuːlə/, is the common name used for several members of the plant genus Plantago whose seeds are used commercially for the production of mucilage. Psyllium is mainly used as a dietary fibre to relieve symptoms of both constipation and mild diarrhea and occasionally as a food thickener. Research has shown lowering of blood cholesterol levels in people with elevated cholesterol, and lowering of blood glucose levels in people with type 2 diabetes. The plants from which the seeds are extracted tolerate dry and cool climates and are mainly cultivated in northern India. Psyllium is mainly used as a dietary fiber, which is not absorbed by the small intestine. The purely mechanical action of psyllium mucilage is to absorb excess water while stimulating normal bowel elimination. Although its main use has been as a laxative, it is more appropriately termed a true dietary fiber and as such can help reduce the symptoms of both constipation and mild diarrhea. 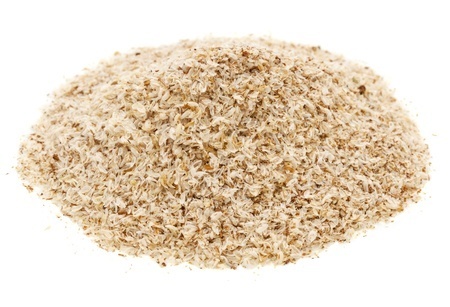 The laxative properties of psyllium are attributed to the fiber: it absorbs water and subsequently softens the stool. It does, however, increase flatulence to some degree. Psyllium fiber is an effective and well-tolerated part of a prudent diet for the treatment of mild to moderate hypercholesterolemia, functioning by interfering with cholesterol absorption. In 1998 the U.S. Food and Drug Administration approved a health claim for dietary psyllium as a soluble fiber that would reduce the risk of heart disease. What was proven in clinical trials was that seven grams or more per day of soluble fiber from psyllium seed husk would sufficiently lower total cholesterol and low density lipoprotein cholesterol in people with hypercholesterolemia, accepted biomarkers for risk for coronary heart disease. None of the clinical trials were large enough or long enough to confirm that consuming psyllium had the expected disease effect. The science available at the time was summarized in a review, and has since been confirmed in a meta-analysis that incorporated more evidence. For a food or dietary supplement for the FDA-allowed health claim it must contain at least 1.7 grams of psyllium per serving, i.e., 25% of the amount designated as effective. Psyllium joined whole oats, barley and sources of beta-glucan soluble fiber as deserving the coronary heart disease risk lowering label claim. The European Food Safety Authority – responsible for reviewing health claim proposals for the European Union – has no record of having considered a psyllium health claim for lipid management. In 2014 the U.S. Food and Drug Administration approved a Qualified Health Claim (QHC) for psyllium being a benefit for people with diabetes. Any company wishing to use this QHC must use the FDA-approved wording on the label: "Psyllium husk may reduce the risk of type 2 diabetes, although the FDA has concluded that there is very little scientific evidence for this claim." A meta-analysis published after the FDA decision reported that psyllium provided before meals improved fasting blood glucose and glycated hemoglobin (HbA1c), but that the larger effect was seen in people diagnosed with and being treated for type 2 diabetes, and only a modest improvement for people classified as pre-diabetic. The European Food Safety Authority - responsible for reviewing health claim proposals for the European Union - has no record of having considered a psyllium health claim for glucose management. As a thickener, it has been used in ice cream and frozen desserts. A 1.5% weight/volume ratio of psyllium mucilage exhibits binding properties that are superior to a 10% weight/volume ratio of starch mucilage. The viscosity of psyllium mucilage dispersions are relatively unaffected between temperatures of 20 and 50 °C (68 and 122 °F), by pH from 2 to 10 and by salt (sodium chloride) concentrations up to 0.15 M. These physical properties, along with its status as a natural dietary fiber, may lead to increased use of psyllium by the food-processing industry. Psyllium can cause allergic reactions, including anaphylaxis. Psyllium may act as a potent inhalant allergen capable of eliciting asthma symptoms. Health care professionals at geriatric care hospitals, who are frequently exposed to psyllium in the laxatives administered to patients, are commonly IgE sensitized to psyllium (13.8%), and 8.6% have clinical allergy to psyllium. The soluble fiber in psyllium is polysaccharide arabinoxylan, a hemicellulose. Psyllium is produced mainly for its mucilage content. The term mucilage describes a group of clear, colorless, gelling agents derived from plants. The mucilage obtained from psyllium comes from the seed coat. Mucilage is obtained by mechanical milling (i.e. grinding) of the outer layer of the seed. Mucilage yield amounts to about 25% (by weight) of the total seed yield. Plantago-seed mucilage is often referred to as husk, or psyllium husk. The milled seed mucilage is a white fibrous material that is hydrophilic, meaning that its molecular structure causes it to attract and bind to water. Upon absorbing water, the clear, colorless, mucilaginous gel that forms increases in volume by tenfold or more. The genus Plantago contains over 200 species. P. ovata and P. psyllium are produced commercially in several European countries, the former Soviet Union and India. Plantago seed, known commercially as black, French, or Spanish psyllium, is obtained from P. psyllium, also known as P. arenaria. Seed produced from P. ovata is known in trading circles as white or blonde psyllium, Indian plantago, or isabgol. Isabgol the common name in India for P. ovata, it is known as Aspaghol in Pakistan, comes from the Persian asp and gul, meaning "horse flower", which is descriptive of the shape of the seed. India dominates the world market in the production and export of psyllium. Plantago ovata is an annual herb that grows to a height of 30–46 cm (12–18 in). Leaves are opposite, linear or linear lanceolate 1 cm × 19 cm (0.39 in × 7.48 in). The root system has a well-developed tap root with few fibrous secondary roots. A large number of flowering shoots arise from the base of the plant. Flowers are numerous, small, and white. Plants flower about 60 days after planting. The seeds are enclosed in capsules that open at maturity. The fields are generally irrigated prior to seeding to achieve ideal soil moisture, to enhance seed soil contact, and to avoid burying the seed too deeply as a result of later irrigations or rainfall. Maximum germination occurs at a seeding depth of 6 mm (1/4 in). Emerging seedlings are frost sensitive; therefore, planting should be delayed until conditions are expected to remain frost free. Seed is broadcast at 5.5 to 8.25 kg/hectare (5 to 7.5 lb/acre) in India. In Arizonan trials, seeding rates of 22 to 27.5 kg/ha (20 to 25 lb/acre) resulted in stands of 1 plant/25mm (1 inch) in 15 cm (6 inch) rows produced excellent yields. Weed control is normally achieved by one or two hand weedings early in the growing season. Control of weeds by pre-plant irrigation that germinates weed seeds followed by shallow tillage may be effective on fields with minimal weed pressure. Psyllium is a poor competitor with most weed species. Plantago wilt (Fusarium oxysporum) and downy mildew (Peronospora alta) are the major diseases of Isabgol. White grubs and aphids are the major insect pests. The flower spikes turn reddish brown at ripening, the lower leaves dry and the upper leaves yellow. The crop is harvested in the morning after the dew is gone to minimize shattering and field losses. In India, mature plants are cut 15 cm above the ground and then bound, left for a few days to dry, thrashed, and winnowed. Harvested seed must be dried to below 12% moisture to allow for cleaning, milling, and storage. Seed stored for future crops has shown a significant loss in viability after 2 years in storage.